Dresden Spray was first introduced in 1935 as pattern number 1001. Originally designed for Harry Wood of Wood &Sons, he decided that the pattern was too difficult to reproduce as a lithograph. Susie decided to produce the design herself and ended up with one of her best selling patterns. Version 1017 with blue/green shaded wash border is the most commonly encountered variant. The pattern appears on most shapes produced by Susie including Kestrel dinner, tea, coffee ware and associated items, Rex shape tea and coffee ware, Doric coffee cups, lamp bases and chargers. decoration technique: lithograph transfer with wash banded or lithograph transfer detailing. Example of the factory mark often found on Dresden which includes pattern name and number. 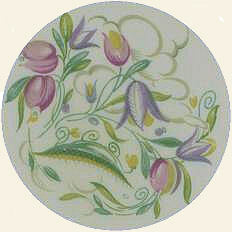 Dresden Spray was so successful that it can be found with a wide range of various Susie Cooper Productions factory marks. Early morning set 9pcs. nine shillings, three & a half-pence. Tea set 21 pcs. nineteen shillings & one halfpence. 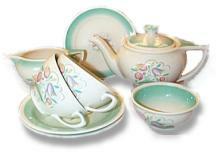 Dinner set 26 pcs. fifty six shillings, eight & a half-pence. 100 piece set comprising Dinner, Tea and Breakfast, seven pounds, nineteen shillings and sixpence.